How dense is Seattle? It depends on what geographic area is meant by “Seattle” and also temporal factors like day of the week and hour of the day. For instance, the Downtown Seattle Association’s 2014 economic report estimates nearly 60,000 residents in the “greater” downtown area (roughly, Mercer to SODO and Elliott Bay to Broadway) with a weekday population exceeding 230,000. That implies a pretty impressive density. And downtown Seattle isn’t alone. Redmond, per the census, has one of the largest increases in weekday population in the country. It’s interesting to see what effect this daytime concentration has on the distribution of people in the region and on overall measures of density. Let’s look at downtown Seattle first. Using the Census Bureau’s 2014 LODES data on primary employment locations, I count about 225,000 jobs in greater downtown. The geographic distribution of these jobs by census block group is shown below. GIS files defining census boundaries came from the PSRC’s public data. 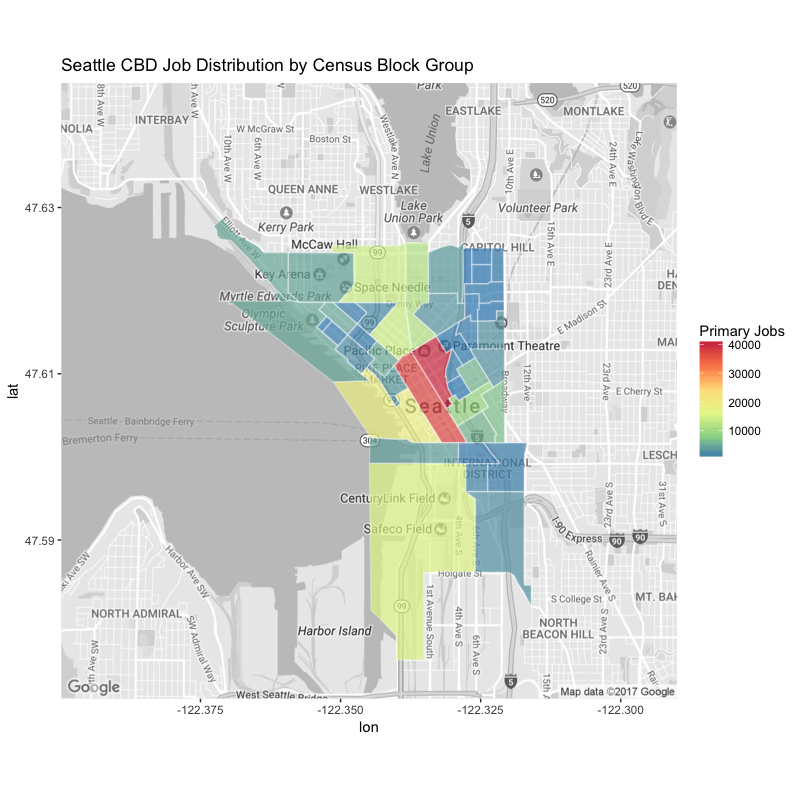 The area adjacent to Westlake Park dominates the map with nearly 40,000 jobs in its block group alone. And of course, most of those workers don’t live downtown; they had to come from somewhere else. The LODES data set comes in handy here because it estimates the home locations, as well as the employment locations, for all workers in the state. After the jump, I’ve mapped the percentage of the population that has a job downtown for every census block group in the metro area based on the 2014 LODES data. You can see similar maps for workers in downtown Bellevue, UW, Overlake, and Paine Field by clicking through the album. So what does this mean for population density on an average weekday? For that, I built a simple model that simulates the morning and evening commute process using population data from the ACS 2010-2014 estimates and LODES employment data. I should note here that LODES data are derived from administrative records that employers submit to States and, as such, will not always list the correct location of home or employment. Student commutes to/from schools are also excluded. So, there is a certain amount of uncertainty in population shifts inferred from LODES data. To add to that uncertainty, my model has a free parameter, a commute rate, which I calibrated via comparison with the Downtown Seattle Association’s estimates of weekday population. 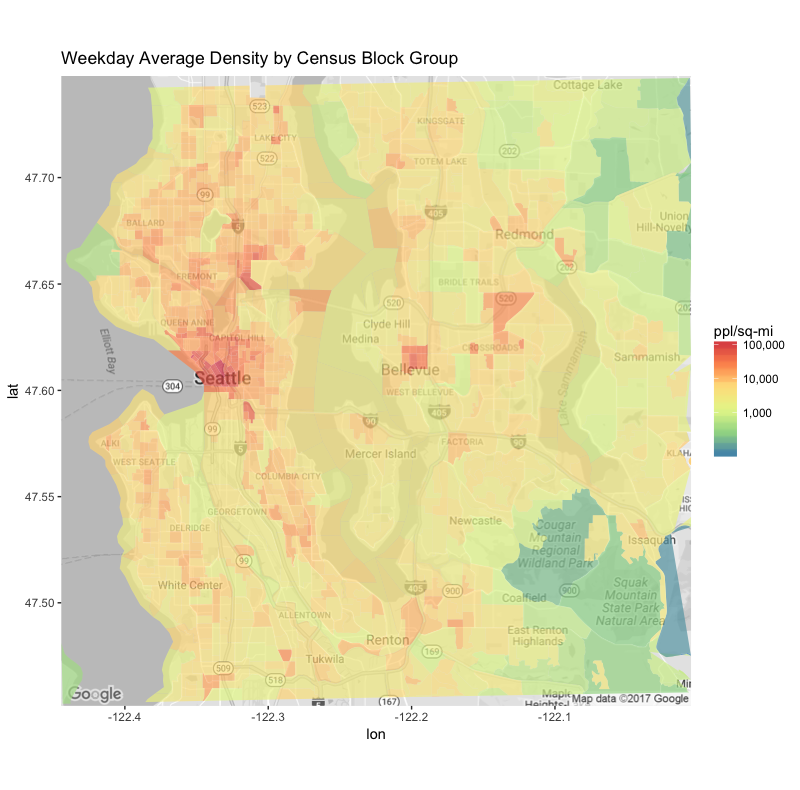 Given those caveats, the final result is an estimate of the population and density for every block group in the Puget Sound Region at any time of day. To condense this information into a more manageable format, it’s useful to average over a typical 24-hour weekday. The map below shows the results of that calculation for the Seattle metro, with the major employment districts of Seattle, Bellevue, and Overlake clearly visible. The main point of this post is to report some representative numbers, so I’ll further average the density over some geographic regions of interest. The second column of the table reports a delightfully wonky quantity called “population-weighted density” which is basically the density experienced by an average person in the given region. Martin wrote a nice piece on weighted density back in 2012 and the census has some interesting material on the topic too. The third column in the table reports the weighted density averaged over a typical 24 hour weekday. As these weekday averages depend on my model estimates, they should be taken with some salt (orders-of-magnitude are probably more relevant). Still, the results here show the reality we are all used to living with: the Seattle metro area consists of high density islands in a sea of sub/exurban sparsity. This contrast is even more clear when employment is considered with population density. To put those numbers in context, consider the densities (as of 2014) for some other cities – New York, San Francisco, and Nashville. Note the stupendous density of the five NYC boroughs; the weighted density is more than five times that of Seattle! And the NYC number includes “suburban” Staten Island. If you’re feeling inadequate at this point, just make a comparison with a typical sunbelt city. Nashville is a similarly sized city to Seattle (pop: 680,000 in 2015), but has a fraction of the density. San Francisco is also a peer in terms of population, but is, of course, far more compact. For transit and its necessary planning, most important fact about population “density” is that the absolute need to draw and bunch together has been in our DNA since we were monkeys. Same time span and intensity for everything else alive. Reflecting Nature’s own truth that a lone anything, especially a wolf, is a miserable doomed short-lived animal. Abandoned or stolen baby monkeys will cry themselves do death. European wealth has flocked inward forever. And friends from Asia tell me they hesitate to bring relatives here because in Lynnwood they’ll literally die of loneliness. That book “The Lunatic Express” notes that passenger loads that often sink boats aren’t forced aboard at gunpoint. And also get better food, though not hard to defeat Amtrak and US airlines. But another really annoying fact is that the better LINK gets, the fewer available seats. Add more cars and you’ll have even less. Current local residential “giveaway” is how few of us were forced out of Ballard to make room for the destitute. And how many of our replacements were just priced out of South Lake Union. By people still just waiting to “flip” ’til the CBD gets some residences. For the last 70 or 80 years, private cars have let people experiment with wider spatial separation. But halls, schools, and utilities districts have never been imposed by invading commandos. Same with gas stations. “Sprawl” as we know and hate it, is really just cities with wider roads and parking lots. All of them presently jammed. Message of the great maps here: Wheels, gasoline, and the Highway Lobby could have turned the whole region a much lighter shade of red. OK, pink. But true colors say that humanity’s own dynamics are on transit’s side. People want to densify. We’ve got the technology. We just need some practice. If people innately want density, why are they so persistent to it? Density is winning in the sense that cities are building growth islands, but only on 10% of the land. The vast low-density single family areas are off-limits because of NIMBY resistance. Recently I saw, somewhere exurban, I can’t remember where, a brand-new subdivision and next to it one under construction. I felt like, this is what Bellevue did forty years ago, let’s not mistake again. But the outer areas are full of it, and when the Times talks about home prices, half the time they’re talking about single-family houses because the rest of the buyer market is too small to matter they think. So there’s still a major space-it is (spell check says spacesuits) going the opposite direction. What happened, Mike, is that, looking at these very large-scale maps first thing this morning, thought hit me that from outer space, compared to the rest of the planet, Bellevue and the likes are still compact. Technologically now, people could live a lot farther apart. Up close, average subdivision has all the faults attributed to urban density- sameness, lack of privacy, and above all, freedom of movement vanishing rabidly to gone. Every time I’m in one of these homes and its neighborhood, I get the sense that house and surroundings are permanent Street of Dreams models. Comfortable living only for human store-window-figures. An artificial abstract of an idea of gracious living. Like something really crappy, overpriced, and much too big, bought because buyer is desperate to conform, even if nothing from shoes to hat even fits. Wonder, incidentally, how many people live in such places because that’s all banks will lend them money for. Current destructive living patterns now keep less of their promise by the day. So change might be easier if we consider the Bellevue Squared you mention as an extensive, very badly designed city. Where many people live because, as Ballard’s ethinconometric cleansing proves, not even middle class people can afford the well-designed ones. I know the law doesn’t permit transit agencies to develop subdivisions. But agencies have been known to partner. Since no private developer from Sound to mountains even has to ask to have his streets feed into highways, a few examples doing same with electric rail might give some interesting lessons all around. If ST-3 isn’t planned to feature some of these “trail-ins- it should. Look up “Karlsruhe Germany Tramways” – links lead to too many ugly ads full of pornographic vegetables. Price it where average sprawl-bound buyer can afford it. Well we know how swiftly streetcar tracks can be paved over. So nothing to lose by checking. Really meant both City Halls and shopping malls. Target and Fred Meyers have always had the money and political clout to put a store in front of every cactus, palm and pine tree on the continent. But “Shopping CENTER” says it all. If not joined by members of its species, a Lone Big Box store is also a miserable doomed short-lived creature. Though like those horrible Jurassic ocean creatures in the prehistoric nature shows that could eat a tyrannosaurus like it was a frog…Thank Gawwwwd for Extinction! Technically, Nashville is a merged city-county government and its metro area is only about a third of the size of Seattle’s in population. Their city-county is about half of their metro population; not the 15-20 percent that Seattle is. It is not very relevent. I would have suggested a more comparable place in terms of city to metro area ratio and how the city limits were shaped. Charlotte? Baltimore? Denver? Dallas? Thanks for making the CBD worker map! It shows how strong commute patterns are in a strong visual way. I would have like to seen a map like this discussed for both today and in the future during the ST3 discussions. These facts could have influenced the project-picking discussions and subarea funding discussions in a number of ways. Nice article! One comment: “Seattle” without a qualifier should not ever include any land outside of the city limits. Nah, I disagree. It’s pretty common for people to refer to an urban region by the name of the primary city. In a technical discussion like this, it’s always best to specify. Budgetary concern, Bill and AJ. Saying or writing “The Central Puget Sound Region” takes a lot of bandwidth and kills Great Forests of trees. Also evidence that sprawl has same effect on words as bad land use on development. By some accounts, however, in most First Nation cultures a dead person’s spirit wakes up every time someone speaks, or writes, or tweets their name. So somebody better go down into the Pioneer Square Underground some night, and give the Chief a good pair of ear protectors. Otherwise, proposed second DSTT could deliver a “Night Stalker” episode that’ll let The Seattle Times crowd-fund a whole revival featuring one of its reporters. “B-b-b-but he grabbed my ear-plugs again!” “Put a sock in it, Kolchak or I’ll put you back on overweight buses and overpriced car tabs!” Can’t fight it, film it and syndicate it. this is awesome! Thanks for putting this together. Correct me if I’m misinterpreting the maps by employment area, but you are looking at employees as percent of area residents. So for example, UW employs 6% of the residents in the NE Seattle lakefront, more than the CBD. If this is true than you might be able to say that the UW is actually what is driving the high end of housing pricing in north east Seattle, not the tech companies. Bremerton downtown has some pretty high densities of workers, most in the ship yard. Civil service, military, and other civilian workers. Downtown residences are growing at a rapid rate. The downtown area is pretty compact.